What Happens When Your Pups Meet A Lego Batman In Real Life?! CGI movies these days have gotten incredibly popular. Despite what you may think, however, creating computer-based animation yourself isn’t that hard to do – it just takes a lot of work and effort, like any other craft! But the end result is always worth it, when you realize just how you can use it anywhere and everywhere! This Dad has taught himself how to animate with a computer, and is now putting those skills to good use! He has taken some videos of his Beagle pup, Louie, and used them to create a story of how Batman from the Lego Movie has come to mess around with this pup! It seems that Batman has his work cut out for him – this pup is bigger and stronger than he is by the looks of it, and is simply dragging him around without a care in the world! Just how is he supposed to handle this pup now? What Does Your Pup Do When You’re Working? Look At This Pup! 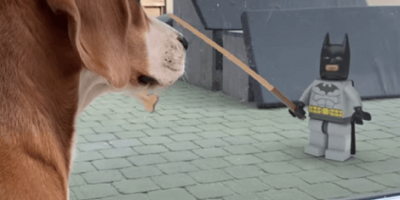 Adorable Pup Sneaks Away From Home To Make An Unusual Friend In An Unusual Way!